Google has Google Instant. Bing has guided search and (soon) swimming whale videos on its home page. 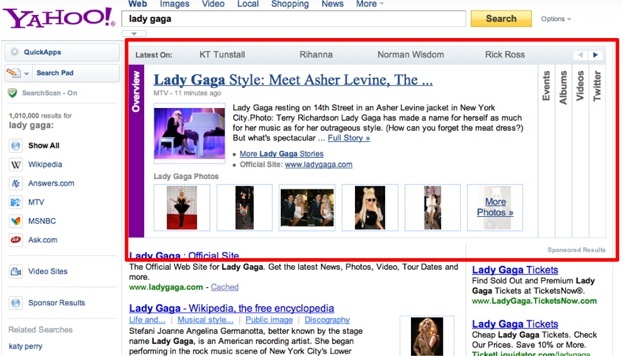 Yahoo, well, Yahoo now has an expanding accordion search box. Starting today, when you do searches related to music, movies, or news, a set of results will be packaged together at the top in a box with vertical tabs along the side. It is similar to Google’s Universal Search Onebox and the Bing Box, except that the vertical tabs create four or five expanding search boxes in one. When you do a search for “Lady Gaga,” for instance, the default box is an overview with an excerpt from her bio, link to her official site, and photos, but there are also tabs for nearby events, albums, videos, and Twitter. The Twitter tab is further divided into her official Tweets, Tweets from Hollywood Insiders, and Tweets from “Everyone” (although it is not really from everyone, Yahoo filters out spam and bots). Similarly, for news, the tabs are divided into stories, images, videos, and Twitter. And for movies, you get an overview with links to trailers, and a tab with showtimes near you. Yahoo also has a partnership with Netflix to link directly to that movie on Netflix, where it can be added to your queue. (Yahoo won’t get paid for each movie that people add to their Netflix list, but will get paid a bounty for new members who sign up for Netflix). These tabs will also be for sale to search advertisers who may want to sponsor one. If you do a search for a trending search topic, chances are you will get a slideshow in the search box, along with photo sand information. (Yahoo loves search-generated slideshows). 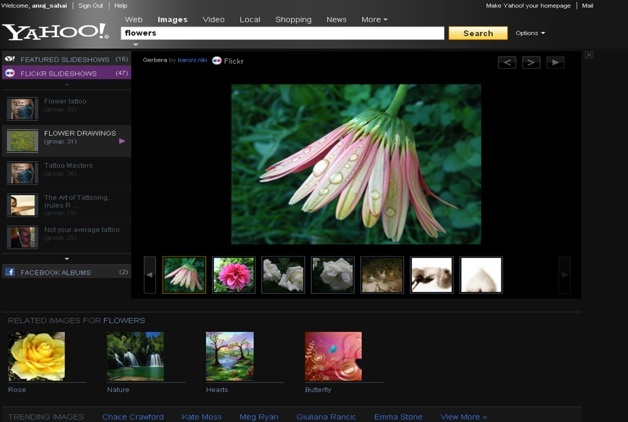 Yahoo is also adding slideshow results to its image search. The top result will now often show a box with related slideshows from different public domain image banks such as Flickr. Finally, Yahoo’s mobile search is adopting HTML5 so that it can show better looking tabs, image search results, and stock charts when applicable.